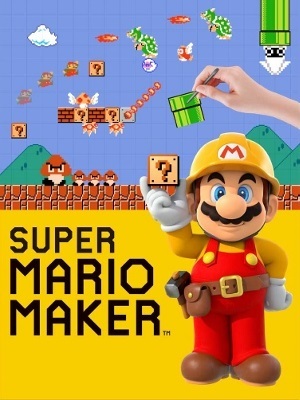 Welcome back to another entry of Super Mario Maker. As some of you are aware, I was the designer of Mountain Top Valley (Ground). In this entry, we will be talking about the importance of giving players different choices on how to tackle situations as well as rewarding players that decide to aggressively challenge themselves and be rewarded for choosing the more difficult path. At the beginning of the course you have the option go down a pipe immediately. The problem that you’ll be facing a certain father and son that you can do very little about at first glance. Having Bowser drop down into his clown car and give chase only to find Bowser Jr. walking a Chain Chomp felt like an interesting way to surprise the player who were expecting something traditional. There are many challenges within Mountain Top Valley. Some easier than others, most all have different way to address the problem at hand. Giving the player these options I felt way a great way to make my course stand out from the rest. As I mentioned before, the first boss battle pits you against the Magikoopa and mega sized Fire Piranha Plant. Both can easily be taken out with a single turtle and continue to the next part of the course. If the player wanted to take them head on, they can do so. 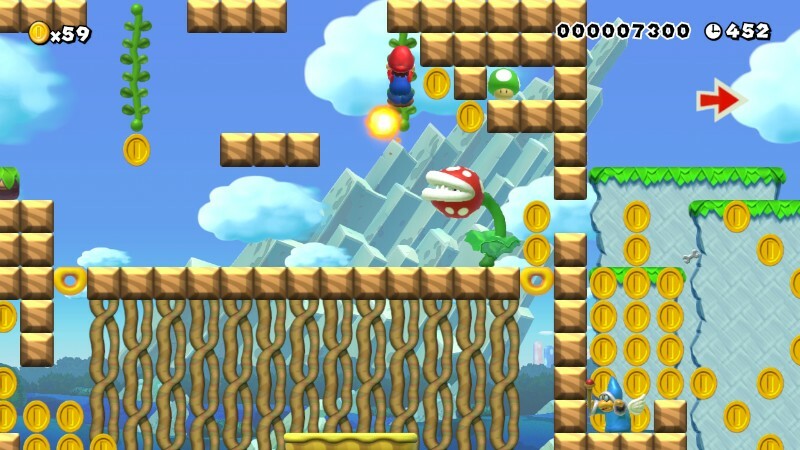 The player may find a 1-Up within the wall but you won’t be able to acquire it without the help of Magikoopa. From running to wall jumping, Mario has always had an amazing athletic ability. Power Ups have always been a staple in Mario’s adventures with each adding new and exciting ways to play. Naturally, it wouldn’t really be a Mario game without them so it was important to have them. But it was more important to place them where it made sense. For example, you’ll notice a floating door that just out of reach as well as a Question Mark Block near the right of it. Hitting the block will reveal the Propellor Hat. Using that item will allow you gain easy access to the floating door and a hidden secret related to Mario. It’s a simple reward, more on the lines of a visual reward than anything that will actually benefit the player. 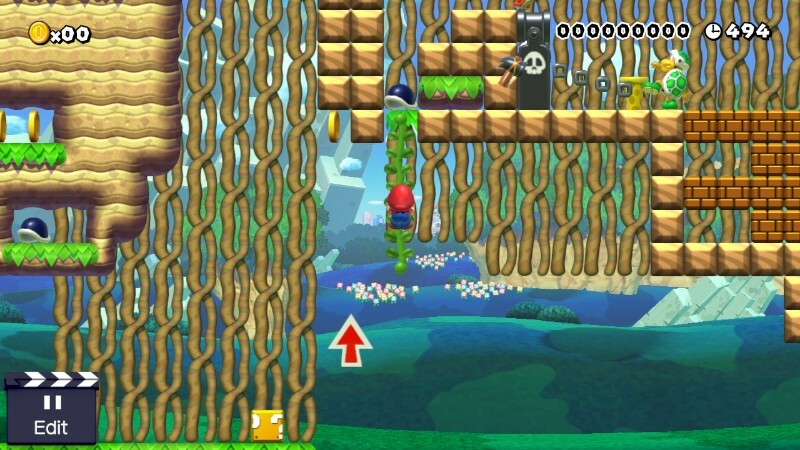 Though there is something on top of Mario’s head if you can figure out how to get up there. Plus I heard that you can actually skip the final boss battle and go straight to the goal post. The final boss battle is filled to the brim with enemies from Chain Chomps to the infamous Hammer Bros. and an endless supply of Green Turtles shot out by a Bill Blaster. I really wanted to give the player options on how to engage the beginning of the the battle in case they felt overwhelmed and wanted a slightly easier way to enter it. At the beginning, the only way to enter was boss battle was through the top and hopefully they were aware that they could add an extra hit if they carried the empty Buzzy Shell, pressed down on the D-Pad and wore it as a hat. Engage from the top or the bottom. I realized that not everyone was going to do this and more than likely kick the empty Buzzy Shell instead. So I decided to add another path at the bottom and in doing so, teaching the player that the empty Buzzy Shell could be used as hat. I also found out that it actually made the final boss battle slightly easier. I really wanted to find an interesting way to send off player before they ended the course. I also didn’t want the player to ignore the final battle and rush over to the end of the goal. I need something that would force them to stay and finish the battle before leaving. It had to be something that was fun but could easily be ignored once executed. For the life of me, I couldn’t figure out a way to do that. I tried many enemies and layouts but it still wasn’t what I was looking for. I knew I wanted to use bricks and some enemy to clear a path towards the goal post. Surprisingly, many of my ideas it didn’t work and I was afraid that I’d have to abandon the idea all together. Then I realized it, turtles were a perfect way to clear the brick boxes. So I placed Green Turtles everywhere and at the beginning, everything was working out, or so I thought. But what would happen if the player took out all the enemies and leaving Mario no way to clear the path and finish the course? This was a big issue until I realized that I could supply the player with an endless supply of Green Turtles all thanks the the amazing Bill Blaster. The only problem was figuring out how to limit their mobility without overwhelming the player with a sea of marching turtles. Luckily, the Chain Chomp supplied the the answer to that with his wooden stake. With the endless Green Turtles shooting out and able to destroy the sealed brick boxes, I was finally able to clear the path for Mario. For those who are wanting try the Gaming After Hours course can do so. We’d love to hear from you. If you have questions for Byungsuk Kim. You may contact him through his twitter account @Byungsuk_Kim. Did you miss out on the first entry? You can check it out here. 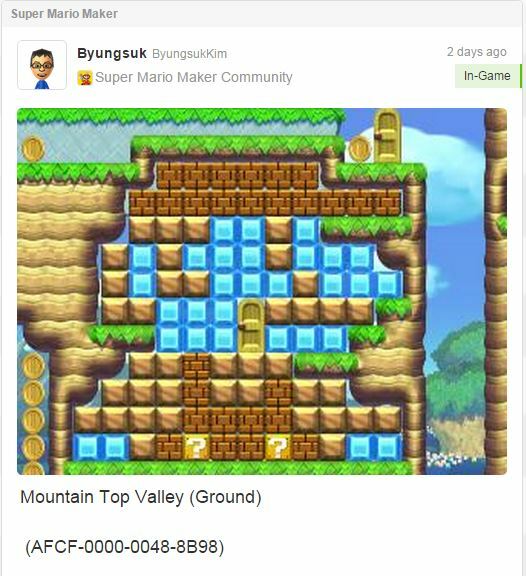 This entry was posted on 11/03/2015 by Byungsuk Kim in Gaming After Hours and tagged Bowser, Mountain Top Valley, Nintendo, Super Mario, Super Mario Maker, Wii U.